President of the Republic of Azerbaijan Ilham Aliyev has arrived in Astara. 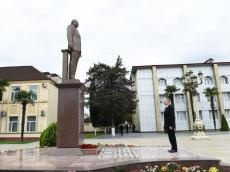 The president laid flowers at a statue of national leader Heydar Aliyev in the center of the city of Astara. Head of Astara Executive Authority Gazanfar Aghayev informed President Aliyev of the conditions created in the Heydar Aliyev Park, and the projects implemented in the district in recent years.